Whether your outdoor living space actually looks tired or you’re just ready for a change, it’s easy spruce up your patio and it doesn’t have to cost a fortune. The hardest part is usually deciding what exactly to do so we’re here to help with the below ten ideas. This probably is the first thing that came to mind, but it’s amazing how much of an impact this one step can have on a patio and it doesn’t have to cost a bundle. Outlet stores around town carry last year’s Sunbrella pillows or you may be able to score a deal online with a little research. If its difficult to locate a pattern that suites your tastes, consider having pillows made. Fabric stores carry a huge selection of gorgeous weather-resistant material. If they upholster cushions and furniture in-house, it’s also possible they may have fabric remnants to sell at a steal of a price. All you need to do is ask. But, if it’s a matter of just giving existing pillows a good clean, we have a guide for cleaning outdoor fabric to help solve that problem. An often overlooked strategy, fragrant plants can definitely boost the appeal of your outdoor space. Scents can have a positive impact on mood, reduce stress, help sleep and even improve cognitive performance, according to experts. A jasmine plant climbing a nearby wall can blow a sweet smell into your seating area. Other flowering plants to consider include lavender, lilac, roses, lilies and sweet peas. Be mindful that flowering fragrant plants attract butterflies and other insects. They can also be overpowering to people with allergies. But if either are a worry, place them in small containers that can be moved around when need be. Mint and other herbs are an awesome alternatives should you not want a plant that flowers (or flowers very much, we should say). Groundcovers such as corsican mint and creeping thyme emit subtle aromas, too. If there’s electricity within reach, its easy to buy a small water feature for added sound and ambiance to a patio area. Soothing water helps mask unattractive ambient noise such as cars, construction and perhaps noisy neighbors. It’s also a good way to add feng shui to your garden. Though they’re a quiet addition, a nearby bird bath can be visually appealing and entice pretty birds into the yard. Just remember that bird baths also need a good clean to keep the birds healthy. 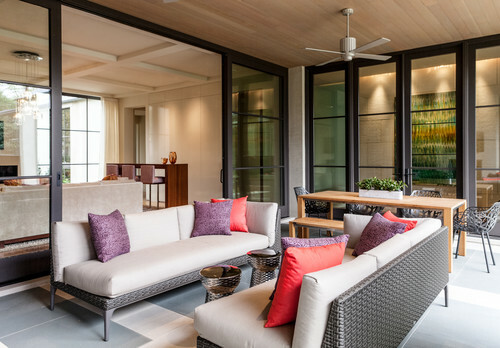 Container plants can make an enormous impact on a space. Consider grouping several in varying heights, adding a small one to tabletops or don’t be afraid to go big. There are even palm trees that grow well in containers. How is this for easy… take succulent cuttings from plants already existing in your yard (in Southern California, you probably have several succulent plants already) and plant them in a container. I do it all of the time. 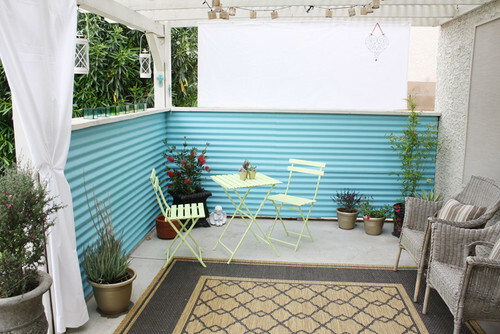 While plants and pillows certainly add color, look around to identify any opportunities to splurge on a fresh can of paint to cover up unsightly fences or even a nearby exterior wall. If you have any tired-looking wood patio furniture, revive it with a fresh coat of colorful spray paint. 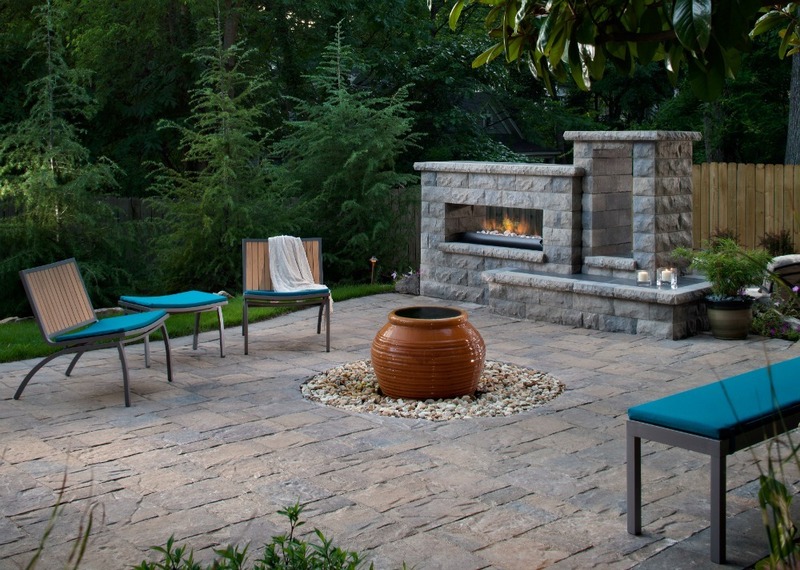 Making sure your patio is lit properly ensures enjoyment long after the sun goes down. 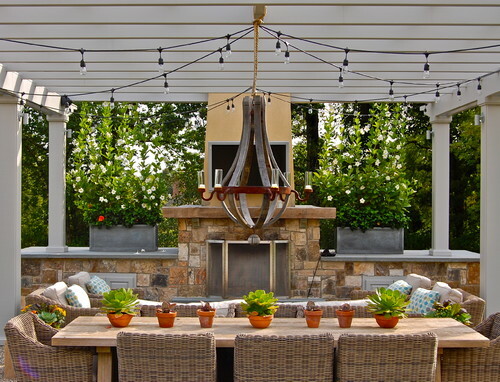 Try a strand of lights dangling from an umbrella or trellis for ambiance. An easy way to shed light on an otherwise dark space is by placing solar in-ground lights in strategic locations. They don’t require any hard-wiring and are pretty inexpensive. Simply add some candles to a table, if safe to do so, or hang a luxurious chandelier to add flair. As you can see in the above picture, there’s nothing wrong with a combination of lighting techniques, too. Incorporating texture is easy to do with plants. Plants with large leaves like alocasia and elephant ears do well in containers while also helping to make a small garden space look bigger. Or, succulents add a modern, architectural feel. Another popular way to incorporate texture is by implementing suggestion number 8 below. Weatherproof rugs now come in a variety of shapes, colors and designs. They are a brilliant way to tie in your color scheme while blending your outdoor and indoor living spaces. 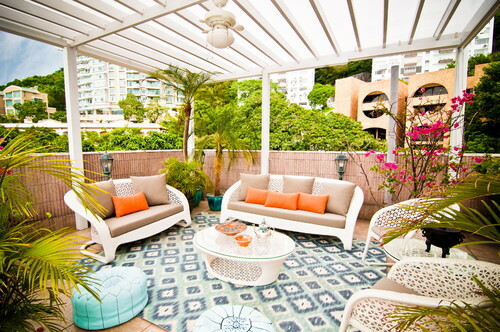 Outdoor rugs are designed to mimic indoor rug design trends. 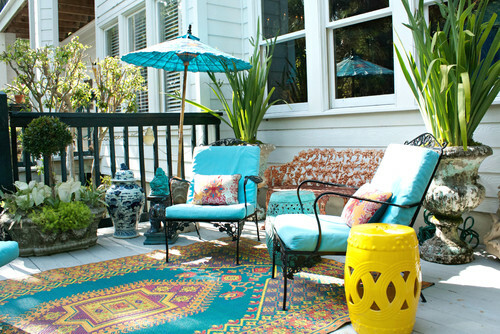 If you have a large paver patio or wood deck, rugs are an excellent way to break up the space. Synthetic rugs like plastic and polypropylene can usually be hosed down for easy cleaning, roll up when not in use and are easy to move around. Natural fibers such as sisal and jute absorb sound and are incredibly durable, which is why they are often used in high-traffic indoor areas as well. Contemporary Deck by Lake Forest Decks, Patios & Outdoor Enclosures Chicago Green Design Inc. 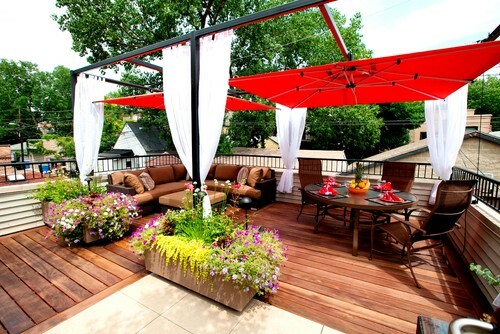 If space permits, adding a pop of color and much-needed share with an umbrella or canopy can spruce up a patio. This also draws the eye up, creating an illusion that the area is larger than it really is. Canopies and umbrellas like the ones above also make the space feel like a separate room, a look that is a popular outdoor design trend. Consider a vertical garden or hanging a planter on bare walls to take advantage of an otherwise blank space. This could be as simple as adding a colored tray or an interesting statue but many homeowners choose a theme and select simple pieces accordingly. Chinoiserie is what the homeowner above chose with a pretty parasol, Chinese drum tables, a blue and white Chinese jar and more. Topics is another popular theme, with tiki torches, tropical plants and other Hawaiian flair. 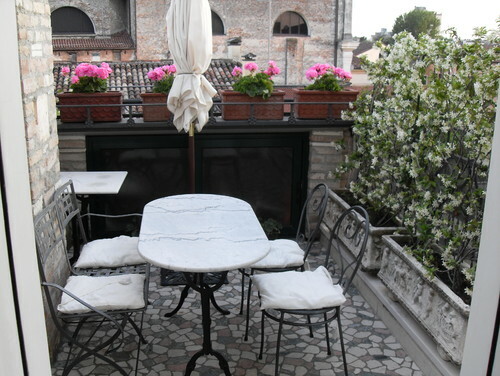 How do you spruce up your patio? And, how often do you do it?